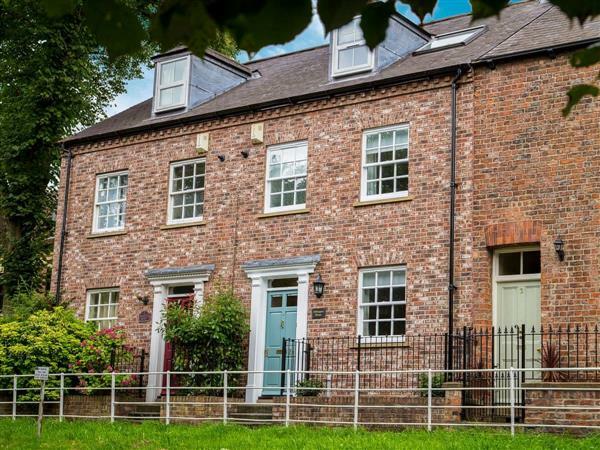 This beautifully furnished Georgian style town house is in a superb location overlooking the medieval city walls, and only a short riverside stroll into York city centre with its abundance of historic sights, museums, shops, pubs and restaurants. This house has been refurbished with new fitted bedroom furniture and carpets throughout, jacuzzi bath and most bedrooms have televisions. Every facility is available to you, including four co-ordinated leather sofas in a spacious living room, with plasma TV and French doors leading to a south facing balcony with tables and chairs. There is a large dining/kitchen with wood flooring, sitting area, TV and French doors leading to a south facing patio. It is ideal to retire to after an enjoyable day out and provides a superb holiday base for exploring Yorkshire’s dramatic coastline and North York Moors National Park. Riverside stroll to excellent Rowntree Park with adventure playground, cafe etc. Sports centre/pool ¼ mile. Boat trips, shops and local inn, 250 yards. Ground floor: Living/dining room/kitchen with French doors. 1 double (5ft) bedroom. Shower room with toilet. First floor: Living room with French doors. 1 double (5ft) bedroom. Shower room with toilet. Second floor: 3 bedrooms: 1 twin, 2 single. Bathroom with jacuzzi bath and toilet. Gas central heating, elec. bed linen and towels included. Freeview TV. DVD and small library. Videos. CD. Microwave. Washer/dryer. Dish washer. Fridge/Freezer. Payphone. Small garden with patio and furniture. Balcony with furniture. Parking (3 cars). No smoking please. No children under 6 years. Family bookings only. Holidays at Abbeygate House run from Friday to Friday. For a better idea of where Abbeygate House is, you can see Abbeygate House on the map below. Abbeygate House is in North Yorkshire; should you be on the lookout for a special offer, you can find all the special offers in North Yorkshire. It's always worth checking to see what is on offer at the moment. Do you want to holiday near Abbeygate House (11608), you can see other cottages within 25 miles of Abbeygate House; have a look to find your perfect holiday location.